Applause Entertainment, the content studio from the Aditya Birla Group brings its audiences a premium drama series that will be a bolt from the blue. ‘Hostages’ is a potent conspiracy thriller fueled by several twists, strong performances and sharp direction. ‘Hostages’ brings together a stellar star cast of Ronit Roy, Tisca Chopra, Parvin Dabas and Dalip Tahil playing key roles. Acclaimed widely by audiences around the world, the Indian remake of this Israeli high stakes thriller from Armoza Formats, will be produced by Banijay Asia. Internationally, ‘Hostages’ generated a great deal of buzz before it even came out and the nail biting series has been hugely appreciated by the audiences. Ronit Roy, a renowned personality of the big and the small screens, who has impressed audiences with his outstanding performances in ‘Udaan’, ‘2 States’, ‘Kaabil’, ‘Adaalat’ and many others is now all set to rule the digital space with his performance in ‘Hostages’. Tisca Chopra who is best known for her work in ‘Taare Zameen Par’, ‘Rahasya’, ‘Ghayal Once Again’ among many films will be seen essaying a crucial role in the show. The ‘Khosla ka Ghosla’, ‘Ghanchakkar’ and ‘Indu Sarkar’ actor Parvin Dabas, who has charmed the audiences with his unique performances is also one of the key members of the cast. Dalip Tahil one of India’s renowned actors, known for his work in ‘Bhaag Milkha Bhaag’, ‘Salaam Mumbai’ and the BBC soap opera ‘EastEnders’ will also be seen playing an important role. And for Sudhir Mishra, the creator of classic films like ‘Hazaaron Khwaishein Aisi’, ‘Chameli’, ‘Khoya Khoya Chand’ and the very recent ‘Daas Dev’, this will be his first web series as a director. Deepak Dhar, Founder and CEO Banijay Asia said, "I am grateful for the support and belief that Sameer has shown in me and my endeavor. We at Banijay Asia are glad to be associated with Applause Entertainment for a prestigious and an acclaimed international thriller like ‘Hostages’. With Sameer Nair and Banijay Group coming together we aim to produce some groundbreaking content across genres for the audience." Sudhir Mishra, director, ‘Hostages’ added, “I treat each and every film/show of mine as the first one, which helps me think of the plot in a new and fresh way. ‘Hostages’ is one such example. For me, every element and every person who is involved in the project forms an integral part, including the actors, producers, writer, cameraman and the whole team. On ‘Hostages’, having a mind like Sameer Nair and a house full of extraordinary actors and writers, I’m enjoying directing this’’. Ronit Roy said – “‘Hostages’ is a show which had me arrested in front of the screen when I watched it. It has been hugely appreciated all over the globe and my character in the series is very intriguing. I constantly strive to keep my audiences engaged and entertained with each of my performances. I’m delighted to work with an excellent director like Sudhir Mishra for this series”. Parvin Dabas commented – “I like taking risks when it comes to playing characters and my role in ‘Hostages’ challenges me as an actor. The script of ‘Hostages’ is spell binding and I’m very thrilled that I’m getting directed by Sudhir Mishra and collaborating with actors like Ronit Roy and Tisca Chopra for this wonderful project”. 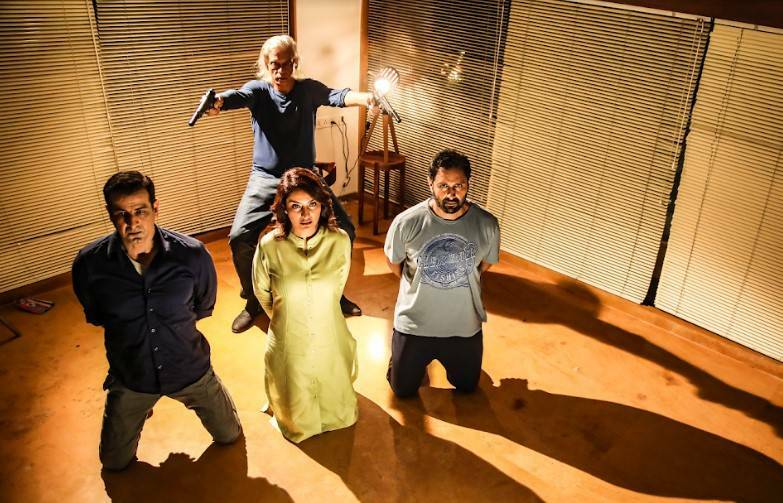 The shoot of ‘Hostages’ is currently going on in Mumbai and the other actors in this digital series are Malhaar Rathod, Sharad Joshi, Aashim Gulati, Surya Sharma and Anangsha Biswas. The show is expected to stream later this year. Applause Entertainment has recently announced an exciting line up of shows that includes ‘The Scam’ with Hansal Mehta, ‘Criminal Justice’ & ‘The Office’ with BBC, ‘City of Dreams’ with Nagesh Kukunoor, and has another 20 premium shows lined up for the year. With this ‘Hostages’ announcement, Applause Entertainment has given its audience one more show to look forward to in the coming year and we can't wait for it to release!